Organic Nopal Powder may lower blood sugar, reduce cholesterol and provide your body with essential amino acids, vitamins and minerals. Nopal, also known as prickly pear cactus, is a succulent cactus indigenous to the Southwestern United States and Mexico. (It's depicted on the Mexican flag.) Nopal has been used as a food and medicine since 900 AD. What are the benefits of Organic Nopal Powder? Considerable research shows that Nopal is effective in stabilizing and regulating blood sugar levels. With regulated blood sugar levels, you'll have more energy, less fatigue and in general, an elevated mood. Nopal works by slowing digestion of carbohydrates that inhibits insulin production. It may help strengthen the liver and pancreas which makes it easier for your body to convert sugar into stored glycogen that supplies the body with energy. Nopal delivers amino acids, fiber and B3 that may work to reduce cholesterol, tri-glyceride and LDL levels. Studies suggest that Nopal breaks down fat and fatty acids and purges excess bile acid that is converted into cholesterol. Niacin (B3), an important element of Nopal, helps transform LDL (bad) cholesterol to HDL (good). Supplies All Essential Amino Acids. Nopal is one of the few plants containing all essential amino acids in an absorbable-branched chain. The essential amino acids are isoleucine, leucine, lysine, methionine, phenylalanine, threonine, tryptophan, and valine. Amino acids are used by every one of the 30 trillion cells in an adult human body. The 17 amino acids in Nopal play a vital role in almost all body functions. They help maintain and repair muscles, organs, nails, hair, skin, ligaments and glands. Nopal Powder contains important minerals and vitamins that may help detoxify your entire body including the liver and pancreas. Nopal delivers essential minerals (calcium, magnesium, sodium, potassium and iron) and vitamins A, B1, B2, B3 and C.
Nopal provides many phytochemicals, which may help keep you healthy by fighting off disease-causing pathogens. 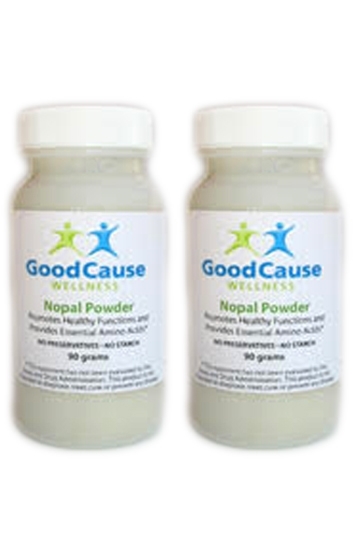 What’s in Good Cause Wellness Organic Nopal Powder? Our Nopal Powder contains freeze-dried Nopal powder and nothing else. It's processed from certified organically grown Nopal. There are no preservatives or pesticides and it contains no starch, sugar, corn, soy, wheat or dairy products. Certified Kosher and non-GMO. As a dietary supplement, dissolve 1/8t. in a glass of juice or water twice daily.